In order to visually grasp in one quick swoop the extent of Britain's heavy industrialisation during the 1920s (notwithstanding the fact that the bulk of its Industrial Revolution had already been through by then), seek no other evidence than photographic - and better still the aerial shots! Britain from Above has made this possible, not only for institutions and corporations but also for the general public, by releasing its impressive photographic archive collection (over 82,500 records for England alone!) which provides the tools for a spot of investigative geography and history, right from the comfort of your home. And fascinating it is bound to be to anyone with a connection to Britain and curious to discover the face of its past! 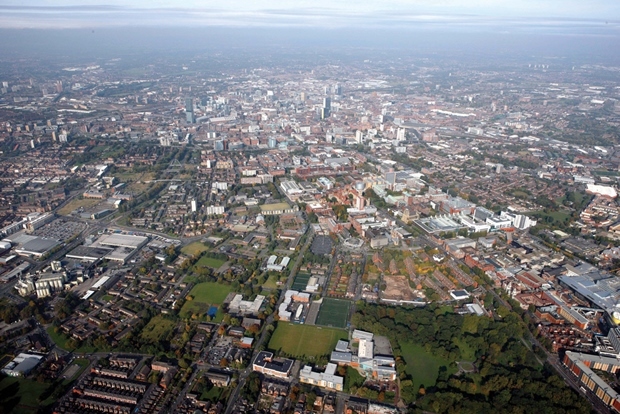 Second to none, Manchester was once my second home; I spent 16 years of my life there. Naturally as soon as I came across Britain from Above, curiosity got the better off me and I sifted through Manchester's photographic records, seeking the familiar neighbourhoods I had lived in and semi-familiar environs which I had travelled through, worked in or visited for one reason or another. Needless to say that present-day Manchester bears little resemblance to its bygone self, bar for specific landmarks: town hall, churches, flagship stores (the Lewis's department store, now Primark), canals, railways, certain roads and playing fields, and the odd pub here and there that has survived the accelerated nationwide 'pub cull' of the last 20 years. 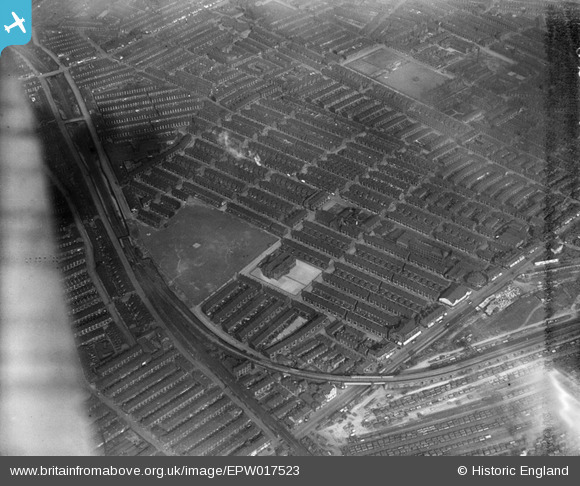 As shown in the Beswick ward above, like elsewhere throughout the working-class areas of the city radiating right out of its centre, row upon row of identikit 19th-century brick terraced and back-to-back factory houses used to be tightly laid out, taking up every inch of available space for cheap low-rise high-density working-class housing - which was turning to slums by the 1920s. Nineteen thirties Manchester was a crowded place; its population had peaked at 766,311 inhabitants in 1931 before steadily shrinking, in line with the collapse of the textile and affiliated machine tool industries, down to 404,861 by 1991, a massive 52% fall in numbers within 60 years! By 1991, the slum clearances and industrial wastelands were lending a surreal urban landscape, especially east (Ancoats to Ashton-under-Lyne axis) and northeast (Cheetham Hill to Oldham axis). 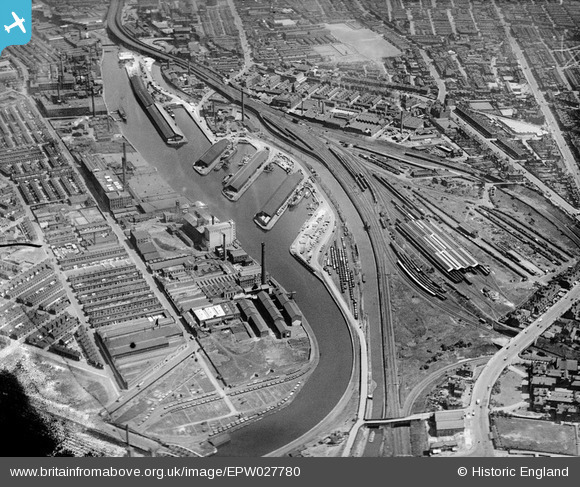 Ordsall Hall Paper Works, Pomona Docks and Manchester Ship Canal, Old Trafford (1929), ibid. From such a bird's eye view, from such a height, with eveything appearing like distant patterns dotted upon a canvas, it is all too tempting to feel nostalgic and gloss over a time period that was actually anything but kind and sweet. Although full employment was on - except during the Great Depression, it still came at a price, even by 1920s standards: harsh working conditions, long working hours, low wages, poor health, cramped and unsanitary living conditions, not to mention the smog, a deadly combination of smoke pollution (from factory and domestic coal burning) and fog, creating pea soup, which plagued industrial cities with a thick yellowish toxic shroud, bringing asthma and other respiratory ailments and drastically reducing visibility. 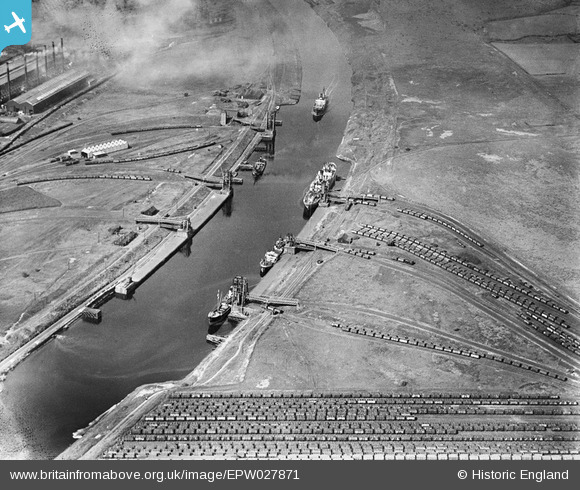 Manchester Ship Canal and Partington Coal Basin (1929), ibid. Furthermore, the nation was still recovering from the throes of WWI, where 23,792 men and women from Greater Manchester alone had lost their lives on the front! Extrapolate this to the number of households affected by loss, the mothers, widow(er)s and orphans, the harsh economic reality of daily life sharpened the grief some more. You can be certain that the photographed households you are looking at are testaments to pain and hardship. Chorlton vs. Didsbury by ibid. Nick Hedges Photography has explored over the last 50 years the reality of life for working-class Britain, via the Slum Housing & Poverty series (late 1960s/ early 70s), showing the impact of sub-standard 19th century housing and economic deprivation. The City That Was explores working-class culture at the turning point of post-industrial Britain, while New Dawns Old Nightmares depicts the depersonalised 1970s utilitarian housing estates that came to replace the torn-down terraced housing communities - the solution to a problem became a problem itself.